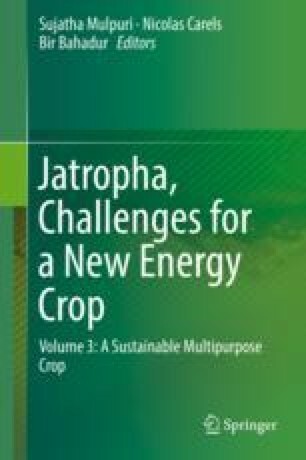 Jatropha curcas L. is recognized as one of the most promising biofuel plants because of the high oil content and the good oil composition in its seeds. Previous studies have established our understanding of the oil yield and quality of Jatropha in germplasm from around the world, which could be helpful for breeding programs. To obtain elite varieties of Jatropha with desirable traits, genetic manipulation technology can offer a feasible strategy of spatiotemporal regulation for expressing the genes involved in oil biosynthesis because Jatropha has the advantages of being a tree of a short generation time and an easy genetic transformation system. Based on recent studies of Jatropha genomics and transgenic analyses, we identified the genes involved in de novo fatty acid (FA) synthesis and triacylglycerol (TAG) assembly here, and we reviewed the gene expression profiles and transgenic manipulation of these genes in Jatropha. This information will be useful for Jatropha oil improvement via the combinatorial metabolic engineering approach. This work was supported by funding from the Natural Science Foundation of Yunnan Province (2016FB048), the West Light Foundation and the Plant Germplasm Innovation Program of the Chinese Academy of Sciences (CAS, kfj-brsn-2018-6-008), and the CAS 135 program (2017XTBG-T02). The authors gratefully acknowledge the Central Laboratory of the Xishuangbanna Tropical Botanical Garden for providing research facilities.